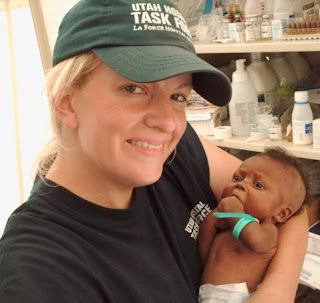 I was standing in the infants hospital tent in Haiti. It was blistering hot inside, and crowded beyond belief. The tent took up half the road, and was snugged up against the curb. We were walking on broken brick road, with cribs and children's beds up against the tent walls. Beside each bed was one small chair with a mother in it. Each mother carefully protected her little child and begged for the needed medical care. But in one little crib at the end of the hot, smelly tent, was a little girl with no mother beside her. I fell in love with her at first sight. She only wore a diaper, and lied on her back, mindlessly staring at the ceiling, while the incessant flies buzzed about and landed on her. She was just a tiny thing, maybe 9 lbs at the most. I asked around trying to find her mother, but no one knew where she was, "she gone," was the only answer I could find. So I picked up the little girl's chart and tried to make sense of it. She had a fever and a disease. That was all I knew. I took the little frail thing from her crib. And as soon as I snuggled her up against me she looked right up into my eyes and smiled. We were instant friends. She cooed and laughed at me. I cooed and laughed right back. She wrapped her little hand around my finger and just smiled at me. What can I say? I was in love! My companion for the day pulled out the camera and documented the moment. I couldn't put my little angel girl down. She was just too perfect in my arms. She was the moment I realized I would never be the same. I would never take my life, no matter how difficult or easy it is, for granted again. I was suddenly alive and my life was filled with purpose.